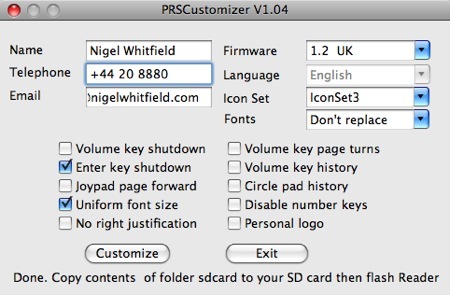 PRS Customizer is a tool for Windows, Mac OS X and Linux which makes it much much simpler to apply some of the common customisations to your Reader. All you have to do is tick the options you require, fill in any details you want for personalising the About screen, and then click the Customize button. A folder called sdcard will be populated with all the files necessary to re-flash your reader, including a copy of the Universal Flasher, so you don’t even need to download that separately. 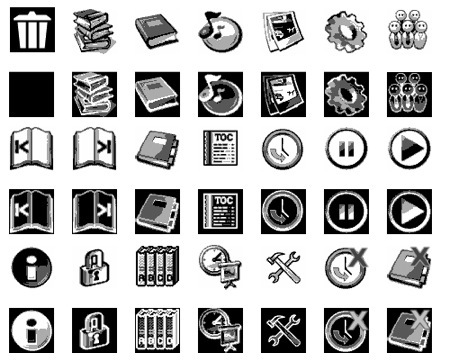 There are three alternative icon sets included with PRS Customizer, if you want a change from the Sony ones, and don’t fancy creating some yourself from scratch.